Dry mouth, also called Xerostomia, is a condition that usually results from decreased production of saliva. At times, Xerostomia can make it difficult to speak and may lead to malnutrition. Extreme dry mouth and salivary gland dysfunction can produce significant and permanent mouth and throat disorders and can impair a person's quality of life. Xerostomia affects about 10% of all people and is more prevalent in women than men. Disorders of saliva production affect elderly people and those who are taking prescription and nonprescription medications most frequently. There are many causes of dry mouth. Xerostomia most commonly occurs as a side effect of many medications, including blood pressure medications, antihistamines, antidepressants, diuretics, non-steroidal anti-inflammatories, and many others. 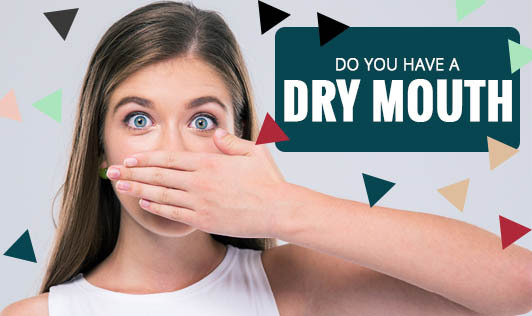 Other causes of dry mouth are radiation treatments to the head and neck, salivary gland diseases, diabetes, hormonal imbalance, and autoimmune disorders such as Sjögren's syndrome, rheumatoid arthritis, and systemic lupus erythematosus. Salivary production can be decreased if a major salivary duct becomes blocked. Other causative factors include stress, anxiety, depression, and dehydration. If you have persistent dry mouth symptoms, contact your doctor!